3 Replies Latest reply on Oct 31, 2018 11:45 AM by Erik . I just started using Wildfly 14 version, before I was using Jboss eap 6 version. In our application we do have Netezza jdbc driver. when we deploy the application into Wildfly 14, netezza driver is not taking by the server. Can any one help on this ? The server log file might have some more exception stacktrace or error messages before that snippet that you posted. Can you paste those relevant details? 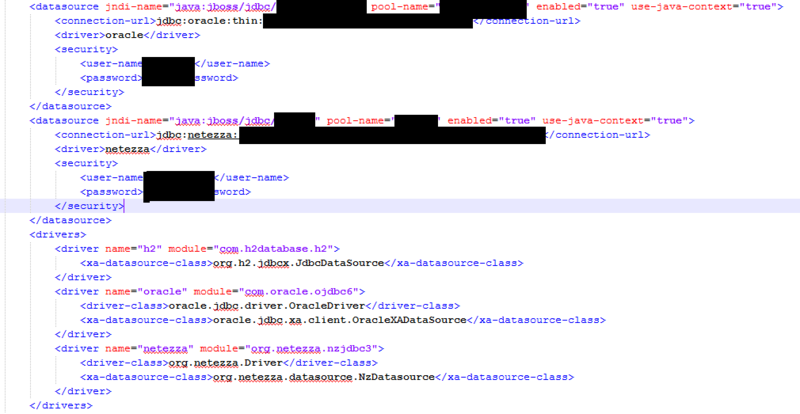 just a guess, but does class org.netezza.datasource.NzDatasource configured in xa-datasource-class implement javax.sql.XADatasource? Quick google search didn't find answer for me. It it doesn't it shouldn't be configured as XA datasource. As Martin Simka saids. According to IBM Knowledge Center org.netezza.datasource.NzDatasource implements javax.sql.DataSource and not javax.sql.XADataSource. In the topicHow to configure Xa-dataSource for Netezza. on this forum, they conclude also that it probably doesn't support XADataSource.